What exactly does it mean to live deliberately, to have an authentic life? Having a sense of purpose? To me, an authentic life means staying true to one's beliefs, values, and life's purpose while contributing to something meaningful, on a grand scale. In terms of physical health, we must stay true to our individual, lifelong journeys of wellness, instead of pledging our allegiance to diet shakes, get slim quick schemes, liposuction, etc. In terms of social health, we must stay true and give thanks to the people who lift us up and give us strength instead of focusing on the difficult relationships that drain us. In terms of emotional health, we must stay true to our love for life and pursuit of joy and happiness instead of worrying so much about what other people are thinking. In terms of spiritual health, we must treat others with compassion and kindness instead of aggression, suspicion and hostility. Regarding intellectual health, we must continue our pursuit of lifelong learning, instead of committing ourselves to one train of thought. Finally, in regards to occupational health, we must utilize our talents to improve our communities and world at large, instead of solely focusing on personal wealth and financial gain. I can't say it is easy to live this way. We live in a fast paced world. Life happens NOW. People want results NOW. However, I think we can all take comfort in knowing that small action steps lead to big changes, and a lifetime of continual change and growth leads to living an authentic life. 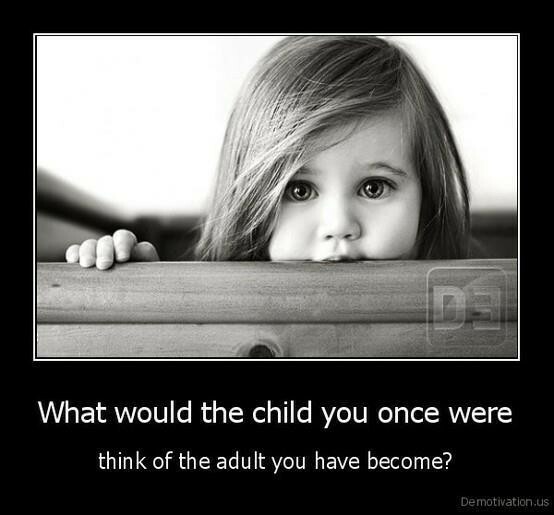 Have you taken enough action steps since your childhood?